This Sunday begins the Christmas season at Christ Community Church. I’d like to share with you four challenges that face our church in December. 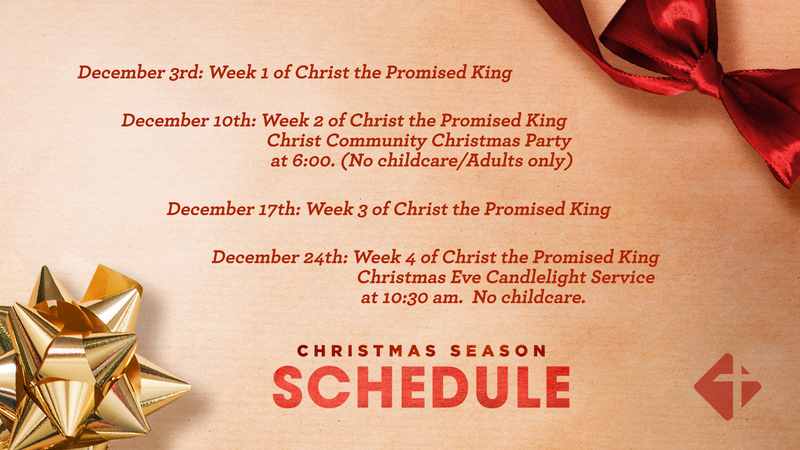 New Christmas sermon series begins this Sunday called Christ the Promised King. Participate in our Christ Community Christmas Party on December 10 at 6:00 p.m. This is a potluck style party, so plan on cooking, baking, or purchasing something to bring with you. Invite someone to join you! Christmas Eve Service on Sunday morning, December 24 at 10:30 a.m.
You can download this graphic and share it on social media if you’d like! Since Christmas Eve is on Sunday, we have determined to place all our energies in our Sunday morning service at 10:30 a.m. Our Christmas Eve service will include worship, baptisms, time in God’s Word, a special time for our children, and a candlelight moment. Many people who don’t usually attend a church worship service are more likely to consider attending church on Christmas Eve. This gives you a unique opportunity to invite someone to church who might just say yes! I encourage you to make the ask and trust the Lord with their answer. So don’t forget, one Christmas Eve service at 10:30 a.m.
Christmas Eve Sunday from Christ Community Church on Vimeo. Challenge #3: Make sure you have honored God with all he has given to you in 2017. One of our key core values as a church is radical generosity. I encourage you to evaluate all the ways God has blessed you and ask yourself if you’ve honored God with the income he’s give you this year, including salary, bonuses, stock, and other gifts. Do not minimize the importance of honoring God with at least one tenth of all he has provided for you during 2017. Consider giving a special gift to our church this holiday or helping a family in need this season. May God be honored in the way we worship him through our giving. Holiday’s can be difficult for those who have lost loved ones, or those who are suffering from disease, cancer, or other physical pain. We have many who are searching for jobs and struggling with family issues. Ask God to meet with our church family in a special way this Christmas season. To be near to the broken hearted, provide healing for the sick, comfort to the hurting, and salvation to the lost. We will have a special time of prayer for these matters this Sunday morning. Please plan to come to be prayed for and to pray with others. Pray for God to meet with us in a powerful way on Sunday, as we gather to celebrate our risen Savior together.